Technology), Assistant Manager (Operations), Assistant Manager (Accounts and Administration), Seed Assistant, Plant Operator, Senior Assistant, Junior Assistant jobs. Total vacancies available in KSSCL Recruitment on regular basis are 43 posts. Candidates who have satisfied all eligible criteria may submit applications in prescribed form before 30 days from the date of notification of this advertisement. Candidates will be shortlisted based on their qualification marks and experience. Shortlisted candidates will be called for Interview/ Document Verification depending on the post. Write the name of the post on the envelope of the application. Selected candidates will get remuneration against each post as per KSSCL rules. Computer knowledge is essential for all posts in KSSCL Recruitment. 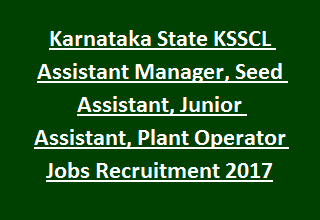 See the below given information regarding the qualification & experience, age limit, selection process, application procedure, Remuneration of Karnataka State Seed Corporation Limited KSSCL Assistant Manager, Seed Assistant, Junior Assistant, Plant Operator vacancies 2017. Closing date for KSSCL application forms: 30 days from the date of advertisement. Total available vacancies in Karnataka State Seed Corporation Limited KSSCL Recruitment are 43 posts. Post Name, No of Vacancies, Pay Scale details are given below. Age limit for Assistant General Manager and Manager Jobs is 40 years. For all other posts age of the general candidates should be below 35 years and for SC/ ST candidates is below 40 years. Assistant Manager (Operations): Must have BSc Agriculture qualification and 3 years experience in Seed Production & Marketing field in a reputed institution. Seed Assistant: Degree qualification in Science with Botany as one of the subject with 2 years work experience from reputed Seed Company or Diploma in Agriculture with 4 years experience from reputed seed company. Junior Assistant: Degree from recognized university and 2 years work experience in a reputed company. Computer Knowledge is essential for all posts. See the KSSCL Notification for other qualification details. Candidates will be shortlisted based on their marks obtained in qualifying examination & experience. Shortlisted candidates will be invited for attending Interview or Document Verification depending on the pot. Applicants who meet the above eligible conditions may submit application forms for specific post through offline mode. Last date for receiving applications is 30 days before the date of KSSCL notification.